Kelly Creates CANVAS Storage Folder 345796* at Simon Says STAMP! 345796 This item is on reserve until If you would like to reserve this item now, you may purchase it now with the rest of your order. We will hold your order now and ship your entire order as soon as this item is back into stock. If you would like your order to ship now, please place this item on a separate order. 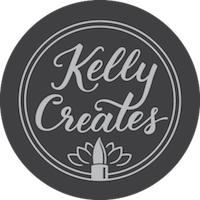 Success, Kelly Creates CANVAS Storage Folder 345796* has been shared! Store all your favorite lettering projects in this durable canvas cover! This storage folder features pockets and pen loops to keep all your favorite tools together. It also includes a removable 35-sheet blank pad, perfect for on-the-go practice! This folder measures approximately 9.5 x 12.5 inches. Artist Kelly Klapstein is known for her relaxed, guided and methodical teaching style. Her distinctive teaching style makes the process of learning Brush Lettering easy, calming and approachable. As a letterer and teacher, she has come up with a comprehensive collection of pens, papers and practice tools. These tools are designed to help students progress from lettering novice to expert while savoring every step of the process.